Sorry for the long hiatus, I just finished my last observation for student teaching so I had several papers and lessons to complete. I only have five days of student teaching left, and I am going to miss my students like crazy, but my posting schedule will return to normal. Enough talking, let's finish up these macaron reviews! Want to know the difference between a Macaroon and a Macaron? Check out the nifty little breakdown in this post. I already discussed the packaging in part 1, so let's get right into the next three flavors. Coffee (tan): The meringue-like biscuits are sweet and mild, kind of like a latte or cappuccino. There are coffee, almond, and vanilla notes. 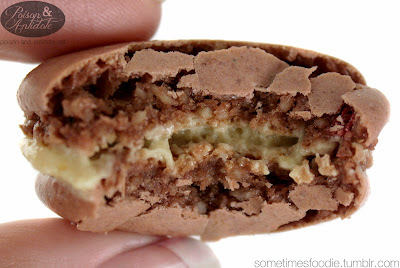 Inside, there is this golden ganache that has a buttery, caramel-like, flavoring. 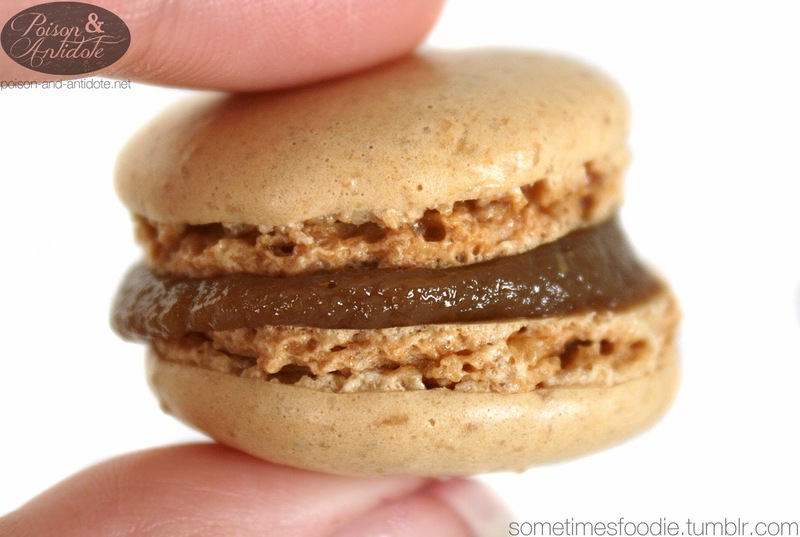 When combined, this little treat tastes just like a caramel latte! Coffee fanatics and casual coffee drinkers can both enjoy this sweet little treat. Pistachio (green): Sadly I forgot to take a "bitten" photo of this one. Unlike the coffee version, the meringue cookies do not taste much like their namesake. The almond flavoring overpowers the pistachio, other than the obvious coloring, I can barely tell that it is supposed to be pistachio at all. The biscuits may not taste authentic, but just like the raspberry flavor I reviewed last week, the flavor payoff is in the filling. There is a rich, gritty, pistachio paste that holds these two biscuits together. Texturally, the filling is very similar to peanut butter. (Is that a thing? 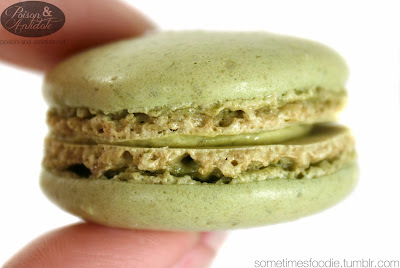 Can you buy/make pistachio butter?) 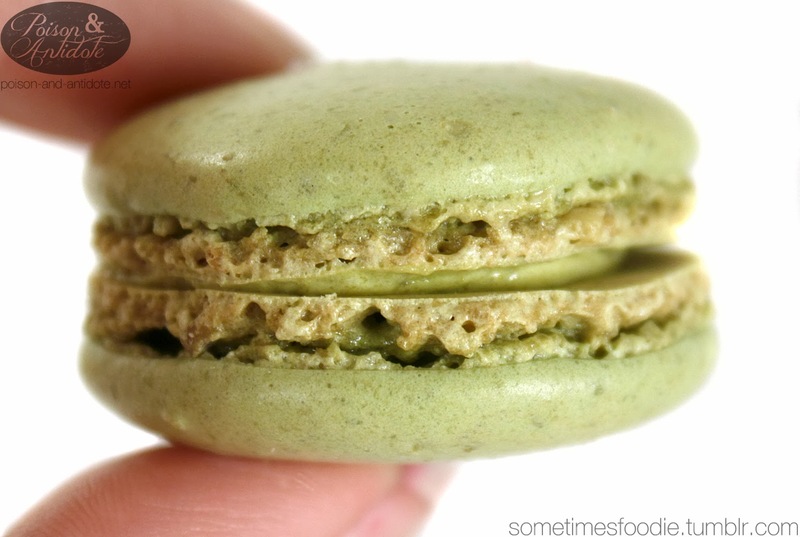 I typically love pistachio flavored treats, but I wasn't too wowed by this pastry as a whole. This might be my least favorite of the bunch. 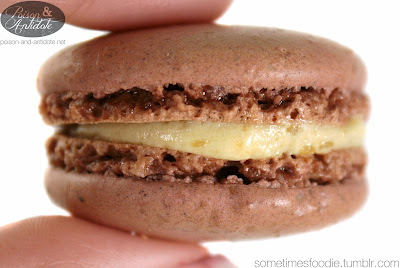 Salted Caramel (reddish purple): The coloring threw me off, at first I had thought that this macaron was the coffee version, but after one bite it was obviously salted caramel. 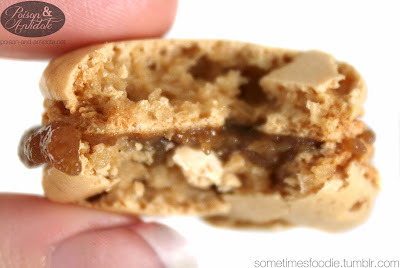 On it's own, the biscuit is rich and buttery with a hint of salt, but there is no caramel. All of the buttery burnt sugar goodness is in the filling. Between the two cookies is a light, fluffy, caramel frosting with a healthy dose of sea salt. You can actually feel the salt's gritty texture on your tongue as it melts away into sweet, salty, nothingness. 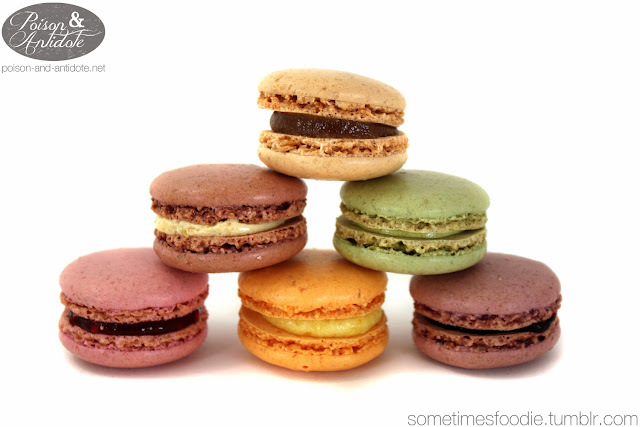 Overall, I enjoyed the first three macarons the most, but none of the flavors were in any way disappointing.